You’ve probably seen them around: marijuana factoids on billboards alongside a teal smiley-face logo for an app company called Weedmaps. Seems pretty innocent, right? Not so, says a stridently anti-marijuana Arizona organization, which is raising alarms over the billboards. The group has asked the Attorney General’s office to investigate the company for alleged false advertising. The group, Arizonans for Responsible Drug Policy, says marijuana app company Weedmaps is relying on disputed statistics about the effects of marijuana legalization in Colorado and Washington. The company’s billboards say the rate of youth marijuana usage in those states has remained unchanged despite pot legalization in 2012. In small print near the bottom of each ad, Weedmaps cites recent surveys done in each state as its source for the numbers. ARDP also called another Weedmaps billboard that touts marijuana as a way to battle the opioid crisis “dangerously false.” The Weedmaps billboard says, “States that legalized marijuana had 25% fewer opioid-related deaths.” It references a much-cited 2014 study on opioid overdose death rates in states that allow access to medical cannabis. ARDP helped scuttle a 2016 ballot initiative to legalize marijuana in Arizona, with financial support from heavyweight donors like Nevada’s Sheldon Adelson. They also received donations from Chandler-based fentanyl manufacturer Insys Therapeutics (whose founder and top executives were recently indicted for bribery and fraud amid the opioid crisis) as well as the Arizona Wine and Spirits Wholesale Association. Last week, ARDP launched a “call for action” email to its supporters asking them to write to the Arizona Attorney General’s office of consumer complaints. 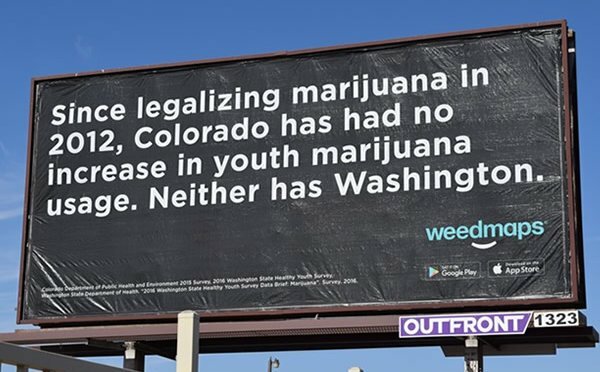 In a sample letter to the consumer complaints division, ARDP wrote, “Advertising on the billboards includes claims that youth use has not increased in Colorado and Washington since legalization of recreational marijuana; claims of a decrease in opioid deaths attributable to marijuana in legal marijuana states; how to find dispensaries; and billboards urging viewers to get high. “These claims are false, misleading and dangerous,” the group added. That’s not all that ARDP threw at Weedmaps. The nonprofit also alleges that these billboards violate the Arizona Consumer Fraud Act, which prohibits deceptive and false advertising. Even more debatable is ARDP’s claim that Weedmaps violates a federal law that prohibits ads that promote an illegal transaction of a Schedule I controlled substance. The Weedmaps app would appear to be in the clear regarding this federal law. On the Weedmaps app, users can browse info on nearby dispensaries as well as cannabis strain and product reviews. A spokesperson for the company said the billboards have sources of the information on display. ARDP looks like it’s ready to counterattack with its own set of statistics. On Monday, the organization announced that it’s launching a new ad campaign. Its latest billboard, a stark black-and-white graphic, has one sentence: “Every 3 days someone dies in a marijuana-related traffic death in Colorado.” No source on that factoid, however.